Many of the traditional wine markets around the world, such as the US and European countries exhibit relatively mature total demand characteristics, although patterns of demand are constantly shifting. Wine marketers wishing to capitalise on expanding wine markets are tending to focus on Asia, and within that, the huge Chinese market gets the most attention, with its growing prosperity and rapidly increasing demand for wines, including imported wines. In China, consumer tastes and attitudes to wine are rapidly evolving. This article provides a snapshot of customer behaviour through the eyes of a lady who works in the wine industry in north-eastern China who has kindly answered some questions. Some helpful data are provided where relevant to expand on some of the points she makes. 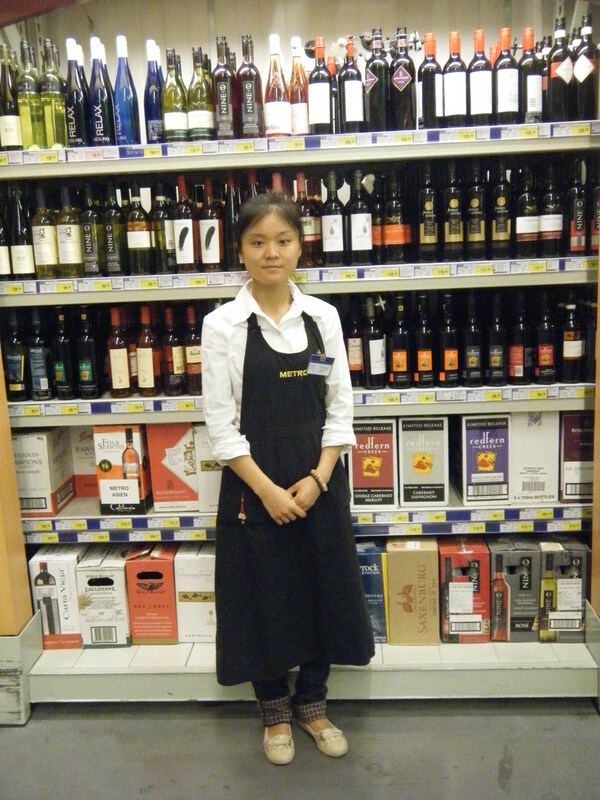 Ruolin Zhu is a Wine Sales Specialist at METRO Jinjiang Cash & Carry in the Tianjin Region of China. Her main duties are to sell wine and other alcoholic beverages, to answer questions from customers, and promote the featured wine producers. METRO is a supermarket chain based in Germany. It is the largest of the chains selling alcohol in the region and offers high quality ‘official’ imported alcohol. With the issue of fake wine being sold in China, customers trust this chain, and buy imported alcohol and the more expensive Chinese alcohol from these stores. For those less familiar with Chinese geography, Tianjin is a metropolis in north-eastern China, bordering Hebei Province and Beijing Municipality, with the Yellow Sea to the east. The population in 2010 was 13 million (census data). The largest coastal city in northern China, it also boasted the highest GDP per capita in 2011 at around US$13,000, above that of Shanghai and Beijing and more than double the national average. Its sheer size and wealth makes Tianjin an interesting market to focus on for wine consumption patterns. Q1: What are the most popular alcoholic drinks? Wine is not the most popular alcoholic drink in China, it is the range of Chinese distilled alcoholic beverages known as baijiu or white liquor. This is also commonly called shaojiu (‘hot liquor’ or ‘burned liquor’) – the heat is from the burning sensation in the mouth during consumption, the fact that they are usually warmed before being consumed, or because of the heating required for distillation. This liquor typically contains at least 30% alcohol by volume and can be unflavoured or flavoured. The primary ingredient of baijiu is usually sorghum, although the primary ingredient of rice baijiu is rice. The prices of Chinese alcoholic beverages are higher than for grape wine on average. Consequently, Chinese alcoholic beverages are highest in terms of total financial revenue, while wine is highest in total quantity. Tigs: National data: in 2011 grape wine sales (value terms) accounted for 56% of total wine sales in China, surpassing non-grape wine sales for the first time in 2010. The volume of grape wine sales was 45.3% of the total. The strongest growth is in grape wine sales, up 220% between 2006 and 2011 (compared to growth of 36% for non-grape wine). Note also that Tianjin will exhibit regional characteristics of consumption – it is likely that relatively more wine is consumed in the large cities of Beijing, Shanghai and Guangzhou than in Tianjin, which might be considered a more traditional Chinese city. Q2: How would you describe consumer preferences for red versus white wine? They prefer red wine. In summer, the sales of white wine increase but they are still lower than for red wine. Tigs: Red wine accounted for 75% of total grape wine sales in 2011. Q3: What do consumers (and suppliers) choose by – price, region, variety, brand, etc.? French wine is ranked the highest, followed by Australian wine. Most people like French wine, but people with knowledge in wine also like to purchase wines from Australia, America, Chile and South Africa. There is a preference for Old World wines and increasingly for imported wines. Tigs: In 2010 France accounted for 46% of Chinese wine imports by value (26% by volume). Australia was second with 19% by value and 20% by volume. Chile and Spain were close behind Australia in terms of volume, but with significantly lower unit value than for Australian wine. The statistics show that cabernet sauvignon (and its blends) is by far the favoured red grape accounting for 47% of sales of red wine in 2011, followed by merlot (17%). Chardonnay is the favoured white grape (43% in 2011), followed by riesling (24%). Q4: What are the key brands of Chinese wine? How would you characterise this wine? Has the quantity or composition of sales of Chinese wine been changing? The most popular wine is from Dynasty Wines Ltd, which is seen as a high quality wine supplier. The prices are generally lower and the age of the wine is better (i.e. older). Due to increasing customer education, more and more people prefer to buy the imported wines. Tigs: Dynasty Wines was the fourth largest national brand owner by volume in 2011 behind Yantai Changyu, COFCO and Yantai Weilong. Dynasty was established as a Sino-French joint venture between Tianjin City Grape Garden and Remy Martin. It was one of the earliest Sino-foreign joint ventures in China and the first in Tianjin. Q5: Is Australian wine seen as different in its product characteristics or branding compared to wine from other countries? More and more people like the wine from Australia because of the ‘good taste’ and the low price. Its popularity is increasing because of the increased advertising in the media. In the view of consumers, Penfold’s represents Australian wine. Q6: What influence does alcohol content have? Male customers usually prefer a higher alcohol content and female customers prefer lower alcohol. Q7: Which wines do you think are mostly bought for home consumption and which for gifts? Most customers buy lower priced wine for drinking at home. Popular wines for gifts are Chateau de Costis from France, and Penfold’s from South Australia. Q8: Do people mostly consume wine before a meal, during a meal, or after a meal? Or do you think they usually drink wine on its own? Most people consume wine during a meal and some female customers drink before sleeping. Q9: Have you noticed consumers becoming more aware of wine countries, brands, varieties and styles? Are people showing more interest than they used to? Do people like to discuss their wine choices in the stores? Yes, consumers are more and more aware of wine countries, brands, varieties and styles. Some of them come to the shop to discuss their wine choices. More and more Chinese people consume wine now. Tigs: Imported wine is in increasing demand in China, as shown by its self-sufficiency in wine dropping from 93% to just 80% between 2000 and 2010. China’s own wine production is expanding rapidly, but imports are expanding far more quickly, as evidenced by these figures. Wine consumption is soaring, with estimates varying widely by source, but whichever figures you believe, China provides an enormous and exciting opportunity for Australian wine producers. And finally – I would like to thank Kai Du at the University of Adelaide for conducting the interview in China on my behalf and Ruolin Zhu for sharing her observations for this article. The answers quoted have been edited for clarity but the meaning has been preserved. This entry was posted in Cabernet sauvignon, New World wine, Old World Wine, South Australian wine, Wine news and tagged Australian wine, Chinese wine consumption, Chinese wine market, Dynasty Wines, Metro Cash & Carry, Penfold's, South Australian wine, Wine. Bookmark the permalink. Hi! My name is Nicole and I found your blog as I was searching for the effects of wine production on Tianjin. I’m a current undergraduate student from the U.S. living in China, and I’m formulating research on the wine market in China. This interview is really great and I was wondering if I could use the information and of course, properly cite/credit this resource? Please do not hesitate to e-mail me if you’d like to speak more. Thank you for your message. Yes please feel free to quote this article. I would be interested to see any research you produce.